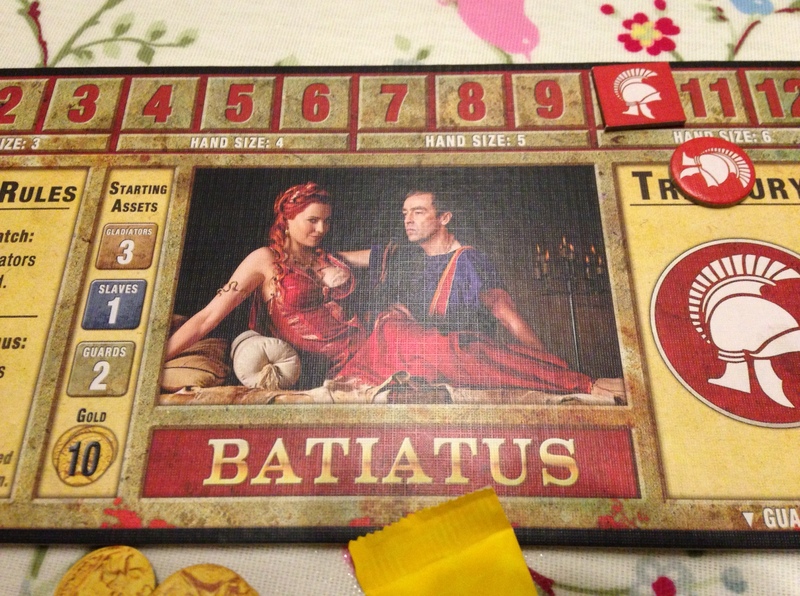 I wound up with Batiatus again who’s always short of money and my betting was woeful for the whole game. Drax on the other hand was pulling money out of the nether left right and centre, I thought for a while he had the pieces from the second copy the game under the table. The trident made an appearance early on (which had been devastating in the last session) but appeared to be made of foam rubber this time as the wielder died in every battle. QUITE a bit of backstabbing went on, in fact there were no alliances and nothing was freely done the whole game, just the way it should be. No decent gladiators appeared and then suddenly Borys was off like a rat out of an aqueduct and he slipped into the lead that couldn’t be stopped despite the best efforts of everyone. It’s not bad, a bit Ascension a bit Dominion but a bit simpler. the primary resource seems to be arse kicking or Power as they politically correctly put it. If you’ve played either of those two games you’ll pick it up in under a minute. Art work is nice, game play is not bad. I’m not a huge fan of this type of game I freely admit although I know some in the group would have whole nights of them if they could. I find them too solitary, I much prefer being able to stick it to someone and shout HA! in their face, but I digress. Just like Dominion you start with a small amount of power cards, buy more and better ones and try and defeat villains to gain score. There’s a set of super villains that you need to defeat (buy with kick assing) and once they’re all defeated it’s count your few points time. 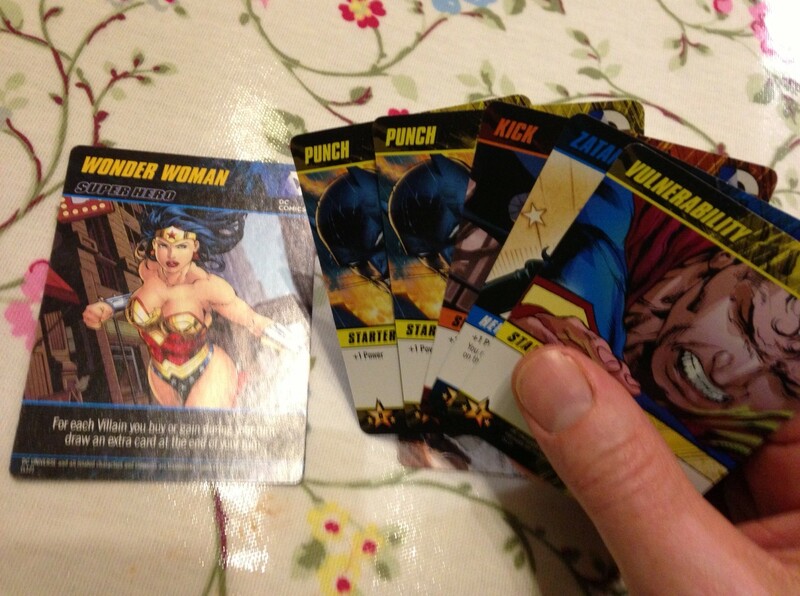 unlike dominion there doesn’t seem to be the same variety of possible game types by changing the setup decks. It does have the half eaten biscuit sensation of wanting a bit more so I’m going to reserve judgement until I’ve played it again. 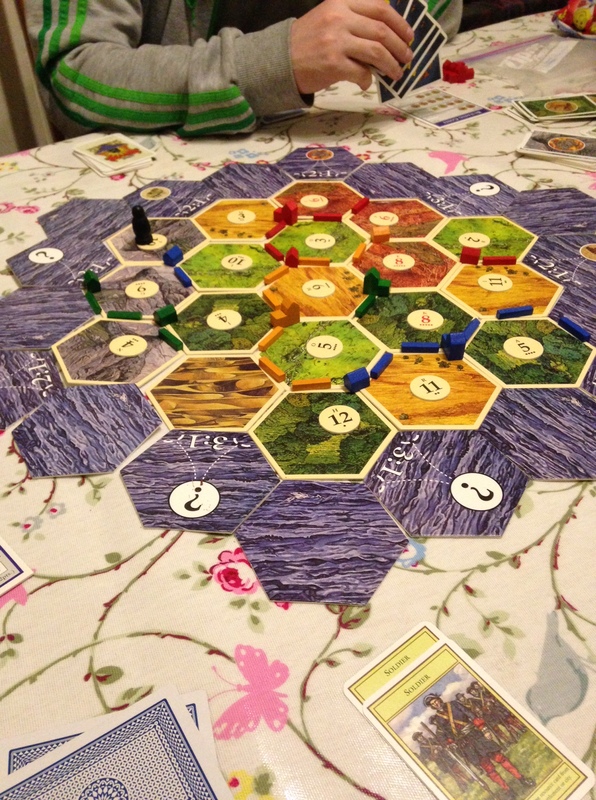 I highly recommend it as it makes for a less random game. Some Awesome start spots and some absolutely terrible ones so an interesting game all in all. “off like a rat out of an aqueduct” – can I quote you, haha? Hmm.. might have to have a go of Spartacus on Bcon Lite.